Yesterday, in the pursuit of research, I had the enormous pleasure of visiting Abigail Crampton, a couture milliner, to learn a little about her art and her business, Abigail Crampton Millinery. I began to understand the difference between picture hats and cartwheels, fascinators and cocktail hats, cloches and trilbies. And the colours and decorations! Stunning. Making a hat by hand is an enormous skill as well as a testament to creativity. Abigail makes bespoke creations so if, say, you want a hat for Ascot, you take along your outfit and Abigail designs a hat that completes your ensemble and is a visual joy. I fell in love with a cocktail hat (probably because the height of the decoration made me look taller) and discovered that I have a totally average head size. I also learned a lot about blocking, steaming, stab stitch, sinemay and the uses of an egg iron. The research is for a novella I’m planning – The Twelve Dates of Christmas. I came away content that I’ve chosen the correct career for Ava Bliss, my heroine. She’ll prosper amongst the sinemay, straw, felt, feathers and veiling. I’ll let the rest of my photos speak for themselves. My thanks to Abigail for giving up her time and sharing some of her expertise. 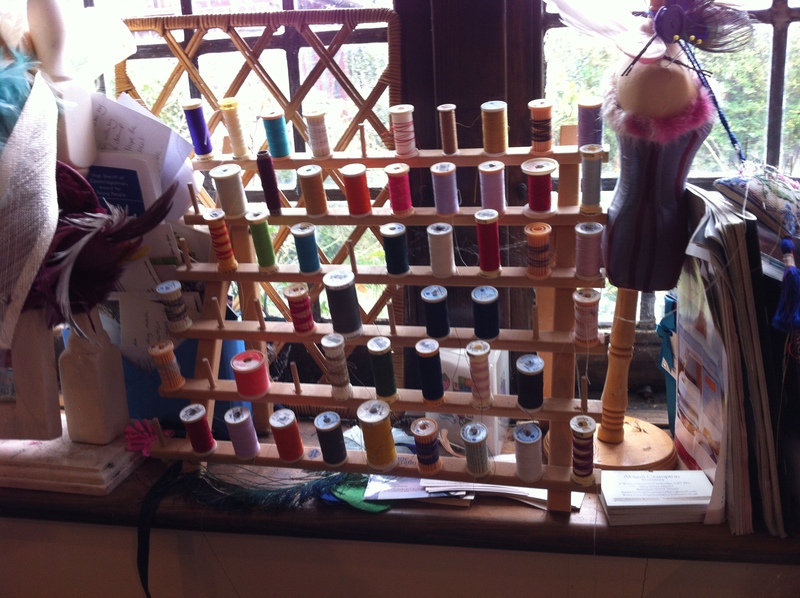 The thread rack. Every thread has to be such a close colour match as to become invisible. Blocks. Essential to the creation process. A block for a snazzy cocktail hat, covered in clingfilm so no dyes can be transferred from creation to creation via the wood.